The Technical Library’s first event. In March 2015, The Technical Library hosted their first event called Lunch at The Library. 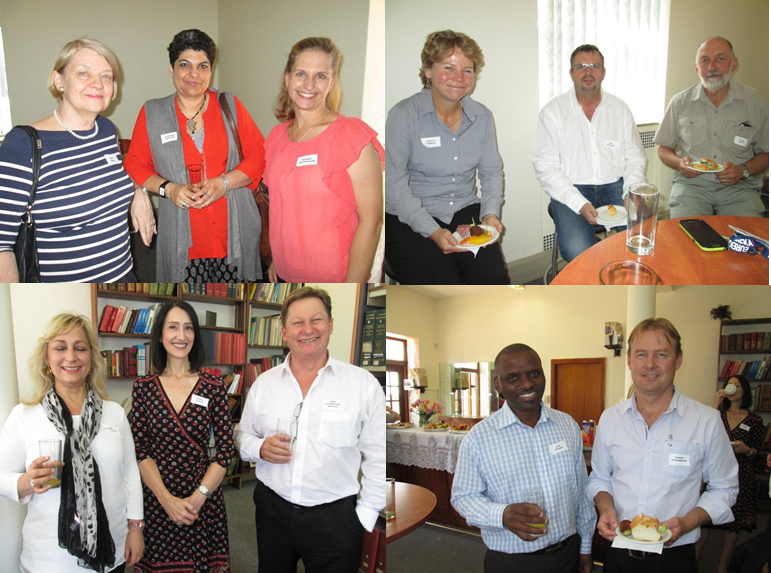 The purpose of this event was to invite clients to come and have a look at the new premises that the library had moved to. This was an opportunity to for us to mingle with clients and to reassure them we will continue to provide them with excellent library services. The Technical Library was originally an in-house library serving the Anglo American Corporation. When Anglo American decided that they no longer wanted to carry the overheads of having a library on its premises, they chose to outsource their library and information management services. As a result of this, The Technical Library was established and our products and services are now available not only to Anglo American, but also the wider mining and engineering communities in South Africa and across the globe. The collection available to our members has been built up for over 70 years now and new information is added to the collection on a continuous basis. The industry in which we operate is very complex and requires a high level of research. The Technical library consists a of a highly skilled team of professionals that have a combined total of more than fifty years working experience in the technical library industry. We all believe that we make a difference because our objective is to deliver a quality service utilizing the systems and resources that are available to us. The Technical Library is a deadline-driven organization and our main priority is making sure that our clients are always happy and satisfied with the services that we provide to them. How to access the Monthly Bulletin. The Technical Library provides research and technical information within the fields of mining, engineering, safety, metallurgy and related disciplines. In order to receive the bulletin (as well as our other products and services), you need to be a member of The Technical Library. There are various membership options available, please contact us for more details on how to become a member. All members of The Technical Library have access to the Library Catalogue and are added to the monthly bulletin mailing list. Look out for our new bulletin format. 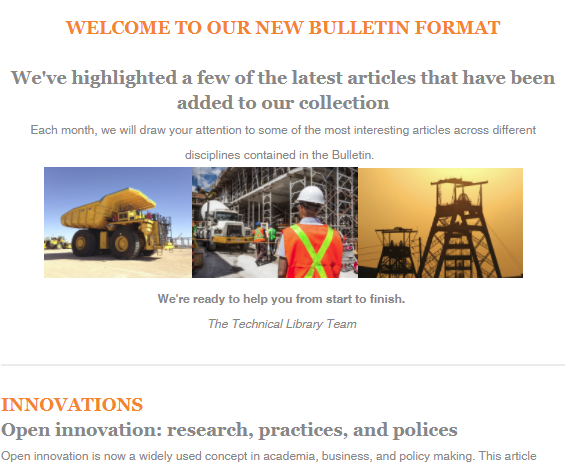 The Technical Library has recently launched a new design for the monthly bulletin. This new format draws attention to some of the more interesting articles across the different disciplines which are published in the bulletin. Please request any articles you find interesting. If you are a member of The Technical Library and are not receiving the bulletin, please contact us.